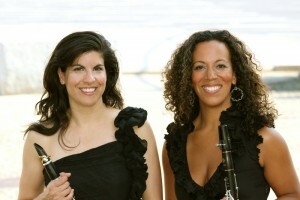 Clarinet Duo that explores cultural and musical dialogues though the works of innovative contemporary composers. These musicians, spoken word and drama artists use percussive elements to highlight the unity of their cultures, Jewish American and Arab American. Weaving a tapestry of intricate sounds and stories, the AdZel Duo is the collaboration of Mariam Adam, renowned clarinetist for the Imani Winds and Stephanie Zelnick, Professor of Clarinet at the University of Kansas. M/A/S welcomes the AdZel Duo in the Baur’s salon for world music lovers to hear where traditional meets contemporary. The AdZel Duo, founded in 2010, has performed and taught throughout the U.S. and Europe to great critical acclaim. Internationally known clarinetists Mariam Adam and Stephanie Zelnick began with a commitment to storytelling though music which span millennia but composed this century. Mariam Adam, born in Monterey, California is a chamber musician and member of the Imani Winds, a Grammy-nominated woodwind quintet. While touring internationally for over a decade, she has played venues such as Carnegie Hall, the Kennedy Center Wigmore hall, Paris’ Cite de la musique, Beijing Performing Arts Center, and other well-known venues both internationally and in the U.S. Soloing she has performed with the Sacramento Symphony, the Monterey Symphony and Prince George Philharmonic, as well as performing with people such as The Jerusalem Trio, Eric Le Sage, Yo-Yo Ma, and Paquito D’Rivera. Member to many ensembles and chamber music groups, she has recorded 7 albums and appeared on many albums including Chick Corea’s “The Continents”, Wayne Shorter’s “Without a Net” and Mohammed Fairouz ‘s “Native Informant”. Mariam Adam is an exclusive Selmer Paris Artist on the Privilege series and a Board member of Chamber Music America. Dr. Stephanie Zelnick, second member of the AdZel Duo is an Assistant Professor at the University of Kansas. She is known for her “Exquisite clarinet solos.” According to the San Francisco Classical Voice. She has performed solo in venues around the world and has played various well-known international music festivals including recently the 34th annual International Music Festival of the Escola de Música e Artes Cênicas da Universidade Federal de Goiás in Goiania, Brazil, the Academia Musicale Vincenzo Bellini in Salerno, Italy, the European Day of Jewish Music in Novi Sad, Serbia, the Berkshire Music Trust in Reading, England, Timisoara Muzicala Academica in Romania, and the National Concert Hall in Taipei. Bound for greatness, she will perform at Carnegie Hall, and The Julliard School with the Imani Winds Chamber Music Festival. Currently the Boulder Philharmonic Orchestra’s principal Clarinetist as well as for the Central City Opera, Zelnick also has been featured on multiple albums and is a Buffet-Crampon Artist. Dr. Zelnick performed with the Czech Chamber Philharmonic, the Prague Opera, and the Johann Strauss Opera in Vienna Dr. Zelnick, and many others. As a teacher, Zelnick has served on the faculties of the University of Wyoming and the University of Northern Colorado. She is an active clinician and has presented master classes at numerous universities and conferences, including most recently in Campinas, Rio de Janeiro, Brasilia. She earned her masters and doctoral degrees from the University of Northern Colorado and Dr. Zelnick’s playing can be heard weekly on NPR and Colorado Public Radio. Hear the beautiful music performed by AdZel woven into the hearts of chamber music enthusiasts live at Baur’s presented by M/A/S in the Baur’s salon on Sunday. August 7th.